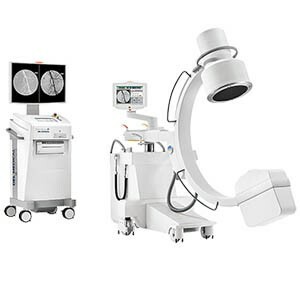 Del Medical’s Vision R Surgical C-Arm is a feature-rich system designed to perform a wide range of fluoroscopic procedures. Its refined movement capabilities, high resolution images, and dose efficiency make it a smart solution for use in surgery, orthopedics, urology, cardiology, and pain management. The Vision R’s use of a rotating anode and high-powered 20kW Monoblock continuous pulsing generator ensures clean, sharp images. With variable pulse widths, the Vision R can handle all general surgery procedures, as well as vascular and cardiac studies requiring 15fps to 30fps to achieve the highest quality images without missing vascular or arterial flow.